Walk around Stondon - Walk 2 at SheffordWalking RouteThis circular walk covers the footpaths of Stondon to the south & east and also strays into Hertfordshire. It will take just under two hours. From Shefford, take the A600 towards Hitchin until the roundabout at Henlow Camp, then turn into Station Road, Lower Stondon. Roadside parking is available - please park considerately. Start Description: The start point is the village sign by the mini-roundabout on Station Road. 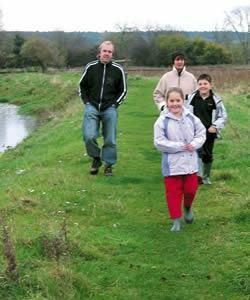 This circular walk covers the footpaths of Stondon to the south & east and also strays into Hertfordshire. It will take just under two hours.